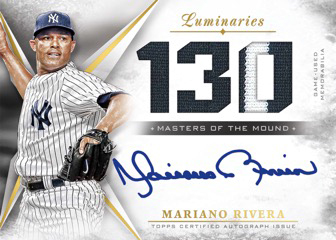 2018 Topps Luminaries Baseball ($199.95 per box), another super premium product, arrives Friday at Sports Cards Plus. The checklist is limited to only the top tier of Hall of Famers, stars and rookies in Major League Baseball. Autographed cuts are plentiful and contain an impressive list Hall of Famers and fan favorites. Each box comes with just one card — an autograph numbered to 15 or less. Like the line’s debut in 2017, the vast majority of cards fall under one of three themes that highlight past and present hitters, sluggers and pitchers. Home Run Kings cards, in all their forms, are all about power hitters. Like the entire 2018 Topps Luminaries Baseball checklist, it’s not just current stars, either. Retired greats and Hall of Famers are also in the product. 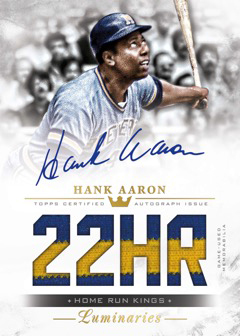 Basic Home Run Kings Autographs are numbered to 15 copies. Parallels come in Red (/10), Blue (/5) and Black (1/1). In addition to these are Home Run Kings Autograph Relics (/15). These have only Red (/10) and Black (1/1) parallels. Autograph patch versions have five copies plus one Black parallel. Home Run Kings Autograph Patch Dual and Triple cards are both one-of-ones. These are done in a book card format. For those looking for larger numbers of autographs, there are a couple more books. The Home Run Kings Ultra Book card (1/1) has ten signatures. And while that sounds like a lot (because it is), the Ultimate Book lands with 50 autographs. 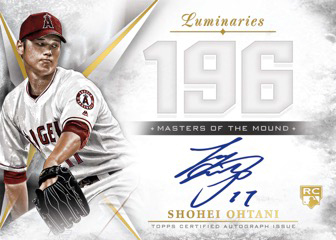 Hit Kings and Masters of the Mound are the other running themes in 2018 Topps Luminaries Baseball. 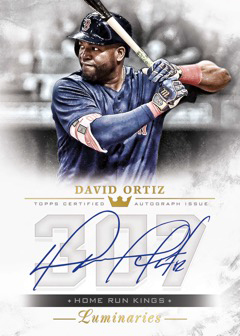 The approach for each is the same as Home Run Kings with regular autographs numbered to 15 and three levels of parallels. The autograph relics for both is also the same with the base versions having 15 copies each to go with Red (/10) and Black (1/1) parallels plus Patches (/5) for select players. 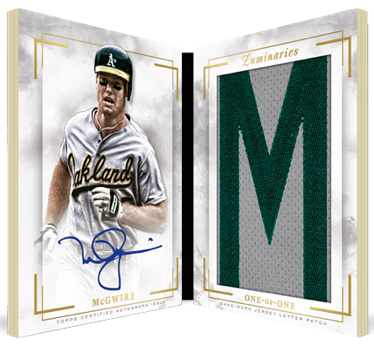 Masters of the Mound has Dual Book cards (1/1) while Hit Kings has Autograph Patch Dual Books (1/1). Ultra Books return for both themes. Like Home Run Kings, these have ten signatures and are one-of-ones. The Hit Kings Ultimate Book has 40 autographs while Masters of the Mound has signatures from 30 different pitchers. 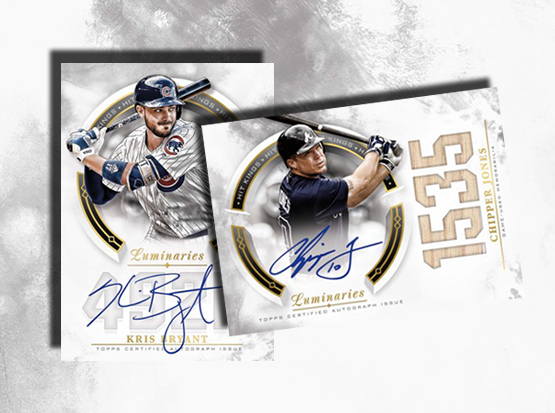 The 2018 Topps Luminaries Baseball checklist rounds out with some additional one-of-a-kind cards. Letter Books have an autograph on one side and a full letter piece from the back of a jersey on the other. Cut Signatures are joined by Cut Signature Relics (1/1) and Cut Signature Bat Knobs.